Hello there, and happy 2018! I have an explanation for my long blogging hiatus (two of them, actually! ), but I'll save that (and some other things that have been keeping me busy) for future posts. Today, I have a little review for you. 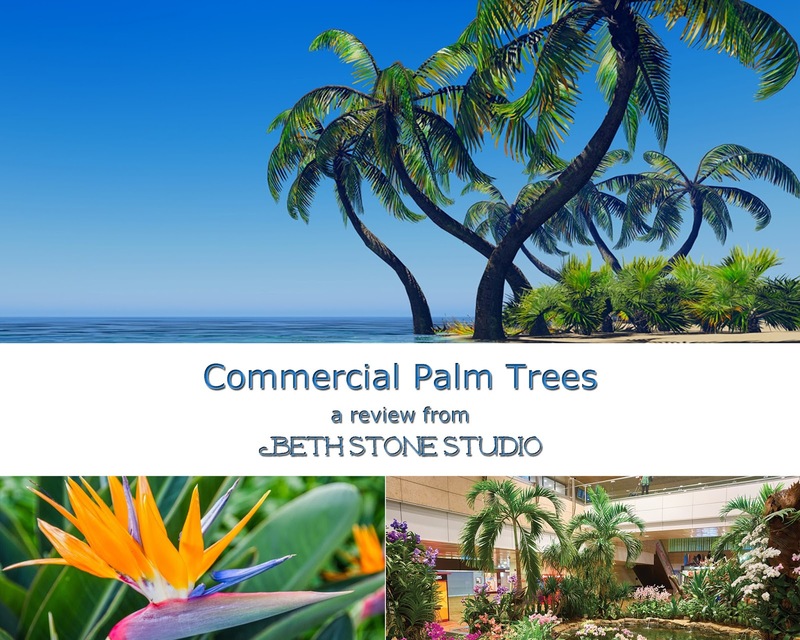 I was recently contacted by the friendly folks at Commercial Palm Trees, located in Minneapolis, Minnesota. They are the lead manufacturer of artificial indoor and outdoor palm trees and related products, designed exclusively for commercial projects and wholesale trade. They kindly offered me a free product in exchange for a neutral review, but all opinions are my own. I suppose I had never really considered the fact that full-sized artificial palm trees are something that can even be purchased, but apparently, they are! In browsing their website, I was surprised at the varieties available, the grand scale of some of the options, and the realistic look of their products. Commercial Palm Trees' design team can transform any lobby, atrium, resort, shopping mall, office, casino, university campus, or any other commercial venue into a veritable tropical oasis! They will work within your venue and budget to create whatever vision you have in mind. From what I can tell from the photos on the site, all of the trees and plants seem to look very realistic, and would certainly add dramatic flair to any indoor or outdoor area. They offer numerous varieties of palms and related plants, as well as landscaping design and installation services to ensure that the final effect is aesthetically pleasing and properly installed. The website is easy to use and well organized. You can also browse photos of past projects for inspiration. The employee who contacted me was friendly, professional, and quick to respond to my questions and concerns. If I were designing a resort or other area which needed some impressive landscaping, I would certainly give them a call! As I, alas, am not the happy owner of a resort or atrium which I can fill with tropical lusciousness, I turned to their residential sister site to find something more suitable for my home. There were several items that caught my eye, particularly the preserved boxwood wreaths and topiaries, but in the end, I settled on these. I had been searching for something to put in the urns flanking my front door, since the real boxwoods I had planted in them last year have been dying a slow, painful death for some time (due to the fact that I often forget to water them - eek). You will notice that the pots are two different styles and are the wrong scale for these plants: a non-issue, since they are meant to be concealed in your own containers. So, I dug what was left of my sad little boxwoods out of my urns and then proceeded to replace them with these bad boys. After packing them in with a little potting soil and finishing them off with a layer of mulch, I breathed a sigh of relief that I no longer have to think about watering them, fuss over how much sunlight they're getting, or watch them die a slow, painful death from my inevitable neglect. Overall, I am pleasantly surprised by how realistic they look. Unless you examine them closely, they could pass for real boxwoods, and they certainly look much better than the old dead ones. They are slightly shinier than I would have liked, but as real boxwoods tend to be fairly glossy anyway, it isn't that big of a deal. When the weather warms up, I intend to pressure wash the house and porch, paint my front door and shutters black to match the swing and rockers, and perhaps even replace the light fixtures with something a little more my style (especially since birds have taken to nesting behind these!). I'll probably add a few pots of geraniums out on the steps (where the rain can water them! ), and I think all of that will greatly add to the curb appeal that we have mostly neglected since moving in. I think we're off to a pretty good start with these, though. Thank you, Commercial Palm Trees! As a special offer for you, Dear Reader, Commercial Palm Trees' residential site, Silk Plants Direct, is offering a 10% discount on their non-custom products. Simply enter the code "BLOGGER10" when checking out. If you are a blogger and are interested in participating in their product review campaign as well, please e-mail me for more information. If I refer you, I will receive a $30 product after your post goes live, and you will also receive a free product to review. Win, win! Thanks for stopping by, and be sure to check out Commercial Palm Trees! Wow, it's been a while. I think I'm just beginning to come out of the fog of sleep-deprivation, stress, and complete lack of personal time that go hand in hand with becoming a new parent, moving across the Atlantic, changing careers, living out of a suitcase for five+ months, searching for and purchasing a new home, and the mounds and mounds of paperwork that accompany all of the above. If you're reading this, it means you've stuck with me over the past year of approximately ZERO posts (or stumbled across this for the first time), and I thank you for your loyalty and interest in my little space here. I hope to make up for the lack of posts in the coming months! Our stuff will remain in storage until we officially close on our home, which means all of my inventory and art supplies are inaccessible to me at the moment. Once we get settled in, however, I will be reopening my Etsy shop and accepting commissions for commercial and residential murals and other projects. Since my focus over the past year has been on a certain tiny person, I don't have much new artwork to share with you at the moment. I think the last few things I painted were pieces for the nursery, so I'll share those with you. Sadly, this nursery is no more, as we have moved out of the charming Spanish house it was in...but happily, all of these items have come with us and will have a new home shortly. 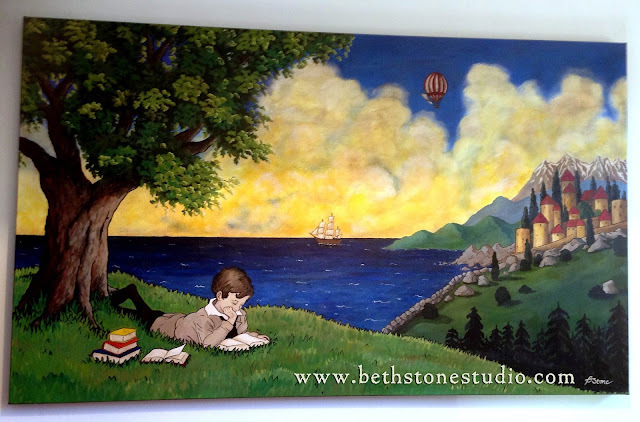 This painting was inspired by vintage travel posters and illustrations from children's books from the Golden Age of Illustration (in the vein of Maxfield Parrish, N.C. Wyeth, Jessie Wilcox Smith, etc.). It's enormous - I wanted a big statement piece for over the crib. I wound up stretching the canvas myself in order to save money and find the size I wanted. You can see the scale in the photo below. I also painted the alphabet lamp and the chalkboard-art style Scripture piece on the wall (although the design is not my own - I found it on Pinterest, although I can't seem to find it there anymore). Here's a close up of the lamp. It originally had cherries between the checkerboard borders (painted by my Mom during a Mary Engelbreit craze), but we scraped them off to make it more suitable for a boy's nursery. I love it. As you can see, his nursery was somewhat eclectic, which is the look I wanted. Themed nurseries are perfectly fine, but I wanted something a little more subtle than having the same fabric/pattern/picture repeated on every item in the room. I guess if you had to describe my theme here, it would be an eclectic nursery based on classic children's literature, travel, adventure, and a traditional European boy's room. I'm not sure if I accomplished that entirely, but we liked it. It was a happy little room, for a happy little person (well, happy MOST of the time, haha!). I was sad to leave it behind... But, it's nice to be back in the States, and I'm really excited about moving into the new house and making it our own. I'll be posting about our home improvement projects as we tackle them, so be sure to stay tuned for those! We are charting new territory over here - our first baby arrived over the Thanksgiving break, and it's been an amazing (and exhausting!) few weeks. We are totally in love though - and who wouldn't be with a face like that? Needless to say, my creative endeavors have been on hiatus lately. I did manage to squeeze a few projects in during the last few weeks of my pregnancy (since I was vegging on the couch most of the time), so I'll be sharing those with you in some upcoming posts. I may also throw in a couple of baby-themed posts (since that's my life these days) - we'll see. 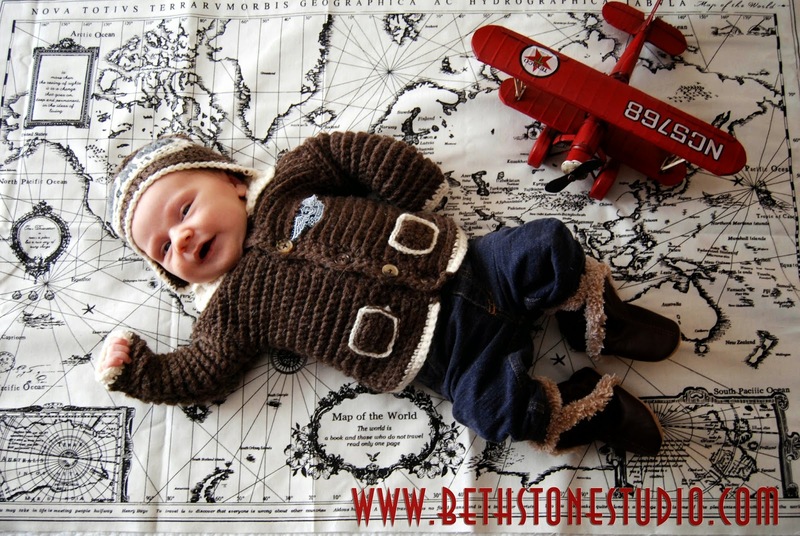 This set was one of my last projects before our little explorer arrived, and it's definitely one of my favorite things I've made for him. He looks SO cute in it! The patterns were really quick and easy too, which was nice. I'll include the pattern links below - you'll need to have a (free) Ravelry account and be logged in to access them. Both patterns are available free from Ravelry.